At a well-attended meeting parallel to SIAL Paris in October, the Bolivian chia sector presented its vision to develop ‘clean chia.’ It also provided a production forecast. Bolivia has become one of the leading producers, along with Argentina and Paraguay, of this superfood rich in omega 3, which is experiencing a growing demand. The Bolivian chia sector and its proposals carry weight. ProChia Bolivia was created a year ago by a group of nine Bolivian chia suppliers and aims with ‘clean chia’ to prepare for the further growth of the sector in a responsible and sustainable manner. The initiative comes at a challenging time, when low prices have led to frustration among producers and exporters. The sector is also struggling to meet strict market requirements for food safety and organic integrity, especially in the European market. The discussion covered other interesting subjects, such as the health properties of chia and new product development. The meeting was arranged in cooperation with the Centre for the Promotion of Imports from developing countries CBI, funded by the Dutch Ministry of Foreign Affairs. So what is ‘clean chia’? According to the presentation of Pablo Altamirano, Gold Foods Sales Manager and spokesperson of ProChia Bolivia, it refers to chia produced in a sustainable manner and aligned with requirements for quality and food safety. ‘Clean chia’ is proposed as an economically viable alternative to conventional chia, taking into account consumer demands and market realities. To make it viable, the sale price needs to increase. Exporters state that the current prices of both organic and conventional chia are too low to justify production costs. Many producers have therefore abandoned production; a point demonstrated in the satellite images shown in the presentation. Adverse weather conditions were also reported to have affected the crop, leading to a production forecast of just 3000 tons for 2016, half of the volume of 2015. In 2014, production reached 35000 tons. ProChia Bolivia manages 70 percent of the country’s 2016 harvest. Pesticide residue is one of the major issues ‘clean chia’ aims to address. Organic agriculture does not permit the use of synthetic pesticides, and residues are only present from cross contamination. In practice, a strict limit of 0.01 ppm, close to the detection limit, determines whether a product is acceptable as organic. For conventional chia, the limit is higher, at 0.1 ppm for most pesticide residues in Europe. Unfortunately, in the Bolivian region of Santa Cruz, these limits are hard to meet, both for organic and conventional production systems. Large quantities of chemical inputs are applied in the cultivation of the main crops of the region, soy, corn and sugar cane, and this can easily lead to cross contamination. A culture of dependency on such substances has been fostered in the area for conventional crops. Change of land use, from forest to agriculture, is another major concern. ProChia Bolivia does not want to contribute to this conversion and plans to grow chia only on existing agricultural land. Ironically, as the producers stated, the strict rules of organic agriculture may act as an incentive for opening up new land, even if this is unintended. After the presentation by ProChia Bolivia, the audience offered some initial responses. Mrs. Rosita Chang of the Dutch importer Berrico Food Company BV expressed concern. The initiative for ‘clean chia’ would sideline organic chia. Concerning a possible relaxation of the organic rules for residues, Mrs. Chang was of the opinion that this was not feasible, noting that “organic is organic.” Organic chia currently represents a significant part of the European chia market. Another question was about how clean chia would be operationalized. Will a new standard be developed? Mr. Michel Peperkamp, an external consultant, speaking on behalf of CBI, suggested that this is indeed a possibility. However, at this stage, the group would first like to assess the traders’ response to the initiative. It was evident that it will take some time before this proposal is operational. Various important questions about the future of organic agriculture still need to be answered. Further research on the most appropriate farming techniques for both organic and clean production of chia may be necessary. 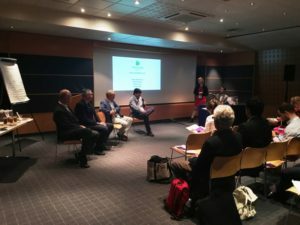 At the meeting in Paris, the Bolivian chia exporters openly discussed their challenges and concerns, and they reached out to the international trading community. Mr. Peperkamp expects that a continuing dialogue will help to position the chia sector better for the future. Meanwhile, the market is developing rapidly- international demand for chia continues to grow, and with the low production forecasts predicted by the region, supply may again become a limiting factor, leading to a new cycle of high prices. ‘Clean chia’ is meant to contribute to a stable and sustainable development of the sector. This article will also be published by Organic Wellness News, Prochia and CBI.